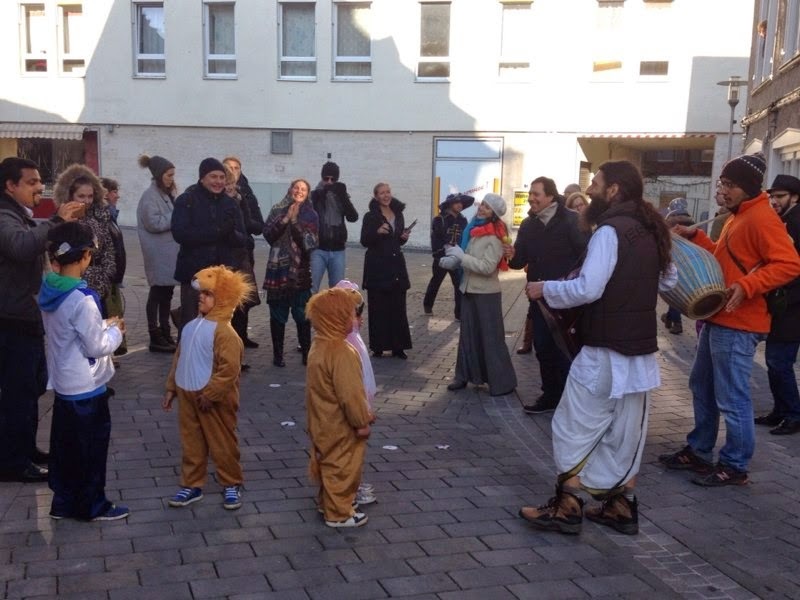 It is our great joy to share publicly with you the new project we have been doing for several months now – the Street Kirtan! We started it in June of last year, inspired by the River Thames boat trip we had with Guruji in London (where we did the kirtan on the boat deck). We played several times in different places in Germany throughout last June and July, but due to the many events we had at the centre, we did not continue. As it was getting cold, and many of you know how it can be cold here in Germany, we did not think we would start doing it again until Spring-Summer the following year. When Guruji inquired about us going out to do street kirtan, he wasn't pleased to find out we had stopped. He spoke with me and urged me to start it again on a weekly basis. So here we are. 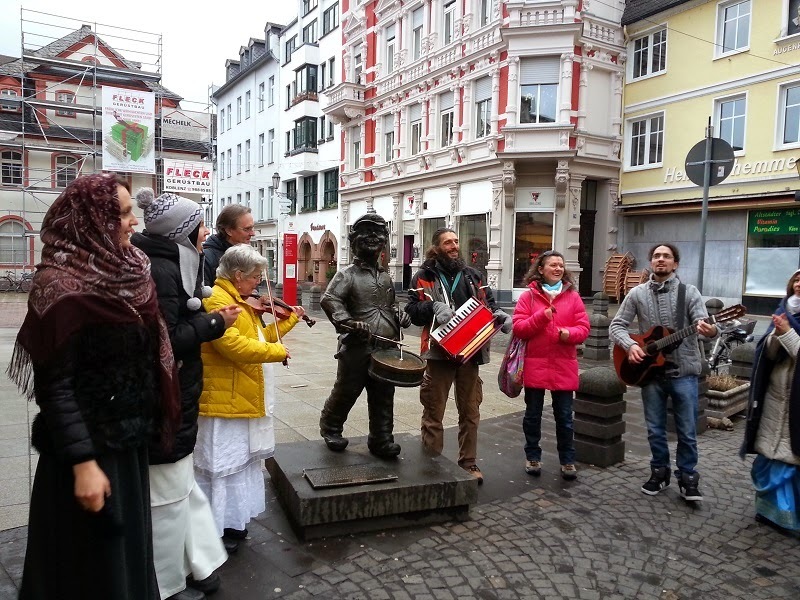 We have been going out every Sunday in different cities, like Wiesbaden, Frankfurt, Limburg, Mainz, Koblenz, Entville, Bad Schwalbach...no matter if it is freezing cold or icy (and we had once temperature of -7 C). We always have different people included. Sometimes we have random guests. Once we had a person, for the first time in their lives, exposed to kirtan singing. Some people are not musical at all and they also want to come and every person is precious. We all carry the dynamo of Divine Love in our hearts and just by joining the singing group, everyone profits. The atmosphere is very relaxed without much preparation: we take the cars and drive, sometimes even changing the destination the last moment, letting Guruji guide our actions and thoughts. Sometimes we have 4-5 people, and sometimes over 20. It does not matter how, what, where, and who. All that matters is that we go out in the streets, parks, metros, any public place, and do it with the love for God and Guru. We spiritualise the streets where we imprint forever the name of God. We meet people and sing the name of God, and we smile at them and with them, and they smile back. Sometimes they react by waiving at us, or moving their bodies to the rhythm of the song, or asking questions. We always give the flyers and pictures of our Guruji whenever we catch somebody's attention or they inquire sincerely. I started to call this project 'Kirtanizing the Cities.' I see a great potential to what we have been doing. The name of God is the only safety we have in this world, and if we can get one person to sing the name of God, we are successful. Just by going out there and spreading the accumulated vibration of love and joy is enough. I urge all devotees to go out as this is not a single-person project, but the project of Guruji and Bhakti Marga and that is our life. If you call yourself a devotee of Guruji and you feel that you are a part of Bhakti Marga family, then let a few of you come together, without much thinking and reasoning, go out and sing the name of God, bringing out the hidden God in all people you meet. Jai Gurudev! 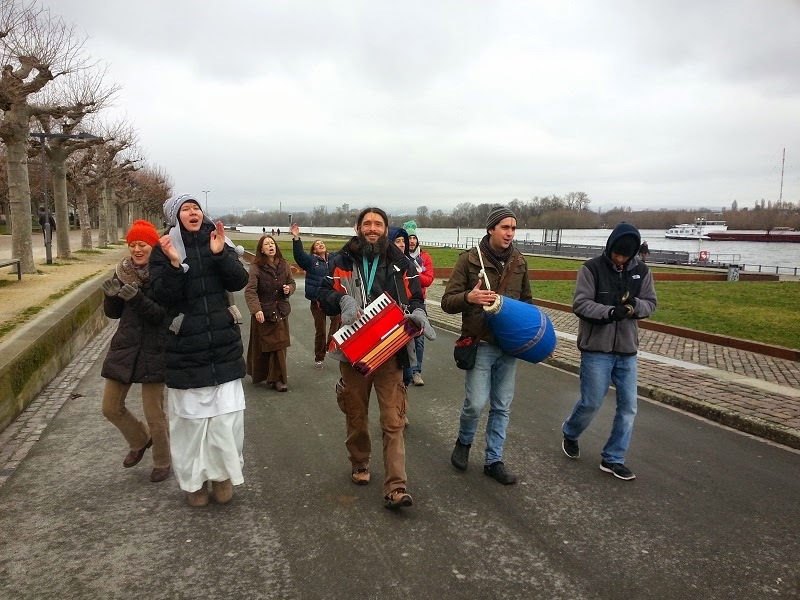 “Street kirtan is a wonderful way to get together and spread the joy of singing God's name. It is a way to touch people's hearts and give them a chance to experience a glimpse of Divine Love, maybe for the first time in their lives. Guruji says that, to hear the name of God, even once in your life, for some souls is enough, so we never know how our singing can affect someone's life and maybe change their directions, at least a little bit towards God. It is also so much fun to get together and go out in the streets with hearts filled with love for our Gurudev, and a strong wish to make this Love grow and grow throughout the streets in the worlds, until one day the whole planet dives into the ocean of His blissful name. So go out and sing for Him. Jai Gurudev! “In the street kirtan it was nice when we all sang and danced together for God. The most wonderful experience was when I was shooting a video and then a group of people happened to pass by. 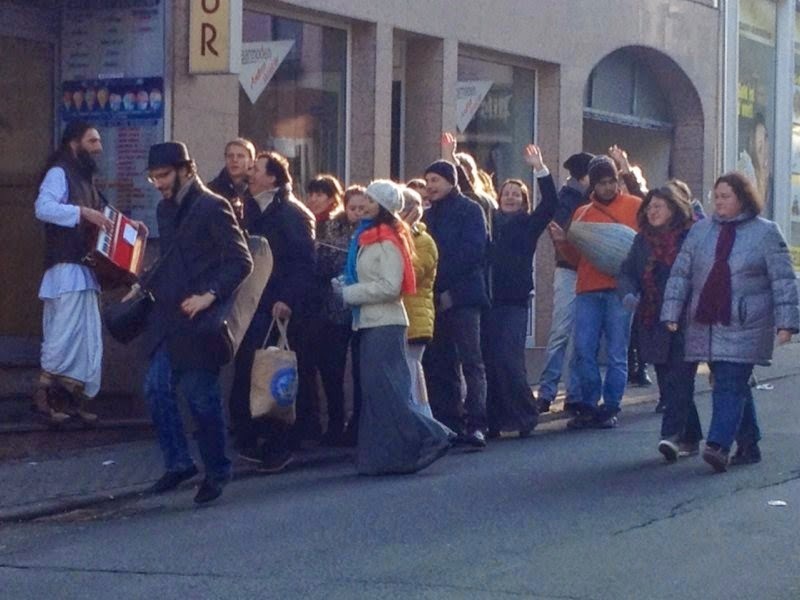 “Street Kirtan is a time when we can go and spread the love of God first hand. Since I live in the ashram, my contact with the outside world is limited, and though this seclusion helps to stay spiritually focused, it can also limit the opportunity to share the Divine Love that the world so desperately needs. I would like to share one interesting incident which happened in Frankfurt a couple of weeks ago. 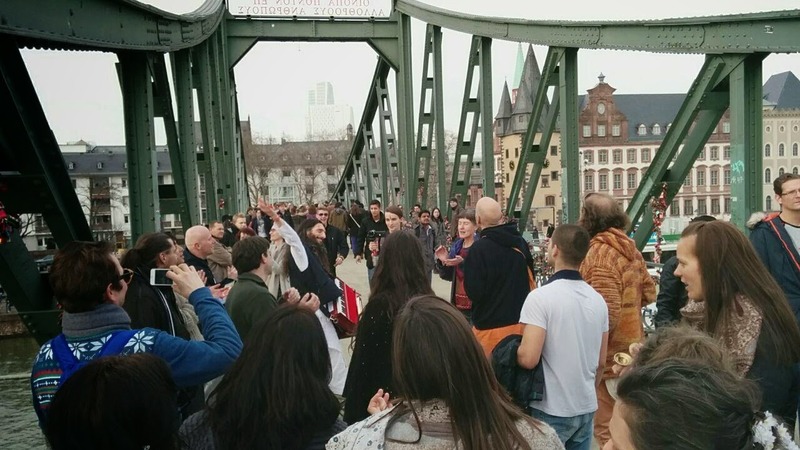 During our ecstatic kirtan we were approached by two police officers. In our minds we were thinking, 'Oh, now we are in trouble!' The policeman spoke with us first and he inquired what we had been up to. We answered him that we were just singing the name of God. He wanted to be re-assured and asked us again if we were, by any chance, promoting some political activities. We assured him that we were not political at all, but spiritual, and we had been just singing various Divine names. While the policeman was speaking to few of us prabhus, his colleague, a policewoman, was speaking with few matajis. She questioned us about our intention. When we told her that we had been enjoying singing the name of God without any hidden motives, she said, "We don't want to stop you. When we cross your path again and we see you surrounded with a thousand people we have to assign it to something – that's why we have to know more about your purpose of singing." We replied, "Oh, we didn't think about something like that." And she said, "Well, why not. I would have been happy for you."